For over 200 years, we’ve complained about gerrymandering for congressional districts. And 200 years later, we’re still complaining about it. In 2015, Ohio voters overwhelmingly supported a commission to address gerrymandering of state districts. Now we have Issue 1 which alleges to put an end to gerrymandering of congressional districts. Will it really create more cohesive districts, or will this be just another empty promise? The Fair Districts = Fair Elections Coalition has been advocating for this issue by gathering signatures to get it on the May ballot, and now they are speaking to outside groups. Ballotpedia has the full text of Issue 1, and Senate Resolution 5 actually provides more detailed information. Their campaign relies heavily on the appeal of bipartisanship. As engaged, black-belt voters who are studying this issue, we are naturally and justifiably skeptical of this promise. Past experiences reveal that “bipartisanship” only means that the bipartisan establishment will protect itself from the grassroots. Instead, advocates for Issue 1 should rely on the requirement of COMPACTNESS. No other measure can be more clearly and easily achieved. Compactness means that districts are geographically tight, preferably in rectangular blocked shapes instead of the dropped plates of spaghetti we have now. It only requires common sense and a simple eye test to see if a district is drawn compactly or if it has tentacles and rabbit trails stretching in all sorts of directions. It does not mean drawing a district that is 120 miles long and only 15 miles wide (Marcy Kaptur’s OH-09). It does not include a district that squirrels through 8 whole and 6 partial counties (Jim Jordan’s OH-04). It looks more like the following computer-generated map at the left. We have to get into SR5 to read what MIGHT be the teeth to requiring compactness. Sec 2 B (5) Of the eighty-eight counties in this state, sixty-five counties shall be contained entirely within a district, eighteen counties may be split not more than once, and five counties may be split not more than twice. The authority drawing the districts may determine which counties may be split. The five most populous counties (drawn in pink at the right) are Cuyahoga, Franklin, Hamilton, Summit, and Montgomery. The most populous 18 counties (remaining drawn in beige) have over 130,000 residents and includes Lorain, Medina and Portage. So while any counties could be split based on the commission’s decision, these are examples of which counties can be split if based on population. Most importantly, none of the other 65 counties can be split! Next, we need to see how much foolishness can be done within these split counties. Sec 2 B 4 (b) If one municipal corporation or township in that county contains a population of not less than one hundred thousand and not more than the congressional ratio of representation, that municipal corporation or township shall not be split. If that county contains two or more such municipal corporations or townships, only the most populous of those municipal corporations or townships shall not be split. Only six cities have more than 100,000 residents: Columbus, Cleveland, Cincinnati, Toledo, Akron, and Dayton. Every other city, village, and township in the state of Ohio will have a single representative. With strict rules, even the most corrupt politicians, whether elected or appointed, will struggle to create a grossly imbalanced map. Only in those six populous cities can a neighborhood be split with regard to congressional representation. Even in the counties that are split three different ways, each city other than those largest six will remain intact. With politicians being who they are, and corruption being what it is, of course there will be instances of slanted districts. It’s also not realistic to expect Republicans to win heavily urban areas or Democrats to win those rural counties by the Indiana border (yet!). It cannot be as bad, however, as the current map which sees Democrats winning their districts with about 70% of the vote and Republicans at least 60%. Democrat voters will be spread out over more districts, and Republicans should prepare to lose their 12-4 House advantage. And some Republicans will vote against Issue 1 because they will lose this advantage. Some feel that “to the winners go the spoils” and that when Republicans win statewide and legislative races (as they have in 2000 and 2010), they should have partisan reign over the district boundaries to create winnable districts. That’s working with the current map where Democrat House members received 47% of the vote in 2012 but only won 25% of the seats. But if we are to believe that competition makes candidates better, then why should we reward representatives with a 10-year contract to serve at their own pleasure for simply winning that first redistricted race? Wanting representatives to derive their powers from the people, we cannot give these people, Democrats or Republicans, a 10-year pass on decisions they may make in office. As angry as conservatives have been at the Republicans in the House since 2010, none has ever been close to losing a primary or in the general. The status quo is not just having Republicans create gerrymandered districts, but it also includes some (not all) grassroots conservatives complaining about being powerless to influence their representation. 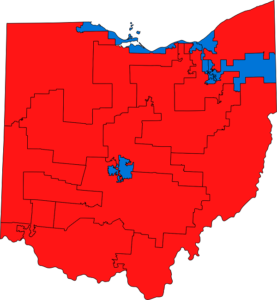 Remember that in the Gingrich Revolution of 1994, a Republican (Martin Hoke) won the western Cuyahoga County district later won by Dennis Kucinich. Also the Youngstown area has seen about a 10% switch away from the Democrat party, so who’s to say that a Republican cannot win that larger region in the near future. Unfortunately, Issue 1 is truly a vote where we will “need to pass it to find out what’s in it.” The promise could be delivered upon with a good map. On the other hand, the bipartisan establishment could find loopholes and exemptions for more of the same type of gerrymandering that protects legislators from their voters. Ohioans will choose whether they want change or if they want the status quo. Even if they do want change, maybe there’s a feeling that THIS change is inadequate so they will wait and judge the next proposal. If they think this proposal will bring Ohio representatives more accountable and responsive to their voters, then they should support Issue 1 in May. 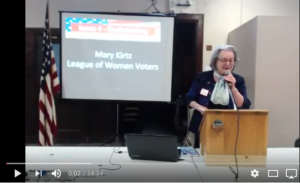 Mary Kirtz of the League of Women Voters spoke at April 14 TEA meeting about Ohio Ballot Issue #1. This is a statewide ballot issue addressing how congressional districts are drawn. Election Ballot Language: (Source: Lorain County Board of Elections) This is what will appear on your Primary Election 2018 Ballot in Ohio. To amend the version of Section 1 of Article XI that is scheduled to take effect January 1, 2021, and to enact Sections 1, 2, and 3 of Article XIX of the Constitution of the State of Ohio to establish a process for congressional redistricting.  End the partisan process for drawing congressional districts, and replace it with a process with the goals of promoting bipartisanship, keeping local communities together, and having district boundaries that are more compact.  Ensure a transparent process by requiring public hearings and allowing public submission of proposed plans.  Require the General Assembly or the Ohio Redistricting Commission to adopt new congressional districts by a bipartisan vote for the plan to be effective for the full 10-year period.  Require that if a plan is adopted by the General Assembly without significant bipartisan support, it cannot be effective for the entire 10-year period and must comply with explicit anti- gerrymandering requirements.